As predicted several weeks ago, the big snapper are in on the west coast! 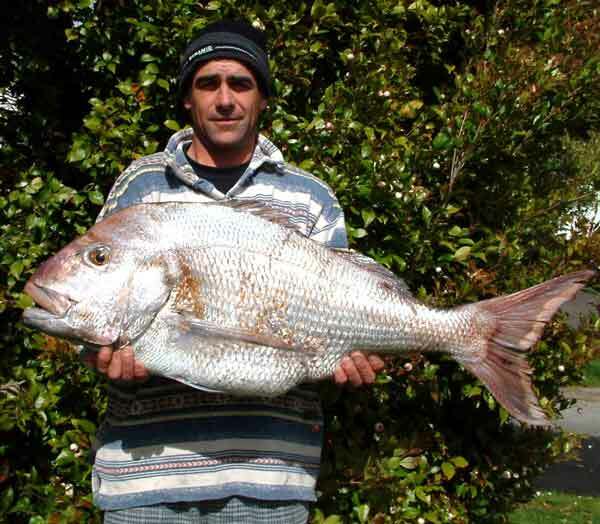 Four snapper over 10 kgs each have been landed by kitefishers over the last week from Muriwai. Two were taken from the top end of the beach, and two from further down the beach around the bombing range. Willie Kipa and his son Shane arrived at our place mid morning on Tuesday August 26 with their magnificent snapper wrapped well with a wet towel. Shane's snapper was in excellent condition and weighed in at 10.4kgs. Shane reported that he had a few days up his sleeve so, taking advantage of the good winds, headed up Muriwai Beach to do some kitefishing. According to Shane, while the winds were very light on the beach the actual wind at flying height was quite strong. He set his 65kg dropper rig at the top end of the beach near the bombing range and baited up with a combination of fresh kahawai and some old squid. The long back trace on his kite powered dropper rig carried a floating bead which, according to Shane, never failed to catch a fish on any set where fish were taken. Although the four sets during the he did during daylight resulted in no fish Shane decided to park up over night and try some night fishing. It paid off. Running three sets at night Shane scored the huge snapper in the picture above as well as 10 other snapper ranging from four to six pounds, four very large gurnard, three sharks and one kahawai. On Sunday August 24 another kitefisher, fishing from the lagoon entrance at the top of Muriwai also landed a 10kg plus snapper during the day which was witnessed by Shane Kipa. Two other separate reports of snapper in excess of 10kg were also received from kitefishers this week. Another kitefisher, also named Shane, reported to Rob at the shop that he landed a 10kg snapper from Muriwai while fishing his dropper rig baited up with mullet. While this Shane only caught the one snapper, he also caught a large gurnard and two spiney dogfish. According to Rob, photos and a full report will follow. Next Meeting: Tuesday 2nd September 7.30pm Manukau Cruising Club. Come along to our September Meeting and hear popular guest speaker, Bruce Riley. He gave a fascinating talk at our July Meeting on Salt-Water Fly Fishing. This month he is bringing a new prototype line-tester, along with his usual informative speaking style. Bring your monofilament or superbraid and he will test the line strength and also the ever critical, knot strength. Joe Renata from Anton's Seafood was our guest speaker, and demonstrated how to fillet a variety of fish. Joe answered members' questions and gave us pointers on how to fillet more efficiently. One point he made was that the knife should be sharp, and for Tony Talbot's benefit, it was suggested that the sharp edge of the knife that should be used for filleting. Joe had an interesting way of cleaning the fish scales off the bench and knife with crushed ice. Some thought this was to cool the knife down as Joe was so fast and he said modestly that he was not at full speed, else we would not be able to study his filleting technique. Anton's Seafood donated all the fish fillets to the club raffle and, especially the members who had winning tickets, appreciated this greatly. Our monthly Club Fishing Day in July was held at Uretiti. Only a few club members attended and there were no snapper caught. Tony said he might have done better had he used bait. Only a couple of monthly competition sheets were handed for July. David Billings fished at Glinks Gully and caught gurnard, kahawai and snapper, the biggest being 0.5Kg. Peter Mason was at Waipu Cove on the 4th of July. He caught 6 snapper and the biggest was 500mm long and weighed 2.5Kg. He was using salted mullet on an outgoing tide and winds were SW. Peter wins this months Silver Pin. Conditions haven't been too good down here as the surf has been high and the rip bad. I put out two sets with my kon tiki from Snells Beach (Opotiki) on the 19/8/03 and both times the rip turned the Kontiki. Although I had a kilometre of line out the gear only ended up about 500 metres offshore. None of the mackerel baits were touched. My friend Maurice had his Flexiwing out but was struggling to get it out more than 400 to 500 metres. He and had no luck either. We were watching a Boat about two kilometres out and from the number of times he moved in a hour, I think the fishing was hard even further out. We are getting closer to the end of the hard fishing I hope. We took the kon tiki out for another try on the 25/8/03. The rip was still very bad here . The first set went out OK and we caught three gurnard but the second set only went out about 400 metres and then the rip pulled the line down the beach. I also spoke to a friend further along the beach who had set his kontiki out about 1200 metres. It got caught in the current and when he went to pull it in he found the rip had pulled it back to only 300 metres and most of the line was in the surf. Until we get rid of the easterlies and big surf that causes the rip, these shallow surf beaches will be nearly unfishable. The following link gives you an idea of what weather is on the way. It covers Australia, part of the Southern Ocean and the Tasman Sea. Don't forget to take your camera when you go fishing and send or email in your pics please.